"Allegory: Plato", oil, 15" x 16"
PCA&D Professor Tom Scullin will be exhibiting his recent work “Allegories” at Ware Center Regitz Gallery. during the month of April. The First Friday opening is Friday April 7. Below is Tom's explanation about his working method for producing these paintings. His take on history if often magical or tragic in character, or deals with issues of morality that questions what is sacred or profane. In these works, he employs surreal juxtapositions, extreme coloration, and dramatic use of light to create a hyper-baroque style. The first thing I need is a stage for my actors. A while ago Pennsylvania College of Art of Design gave me and other faculty a travel grant to aid in the development of artwork. Since I had previously traveled and interpreted the sublime American Southwest for many years, I decided to return to a theme that I had previously explored over a short period of time: historical allegories. 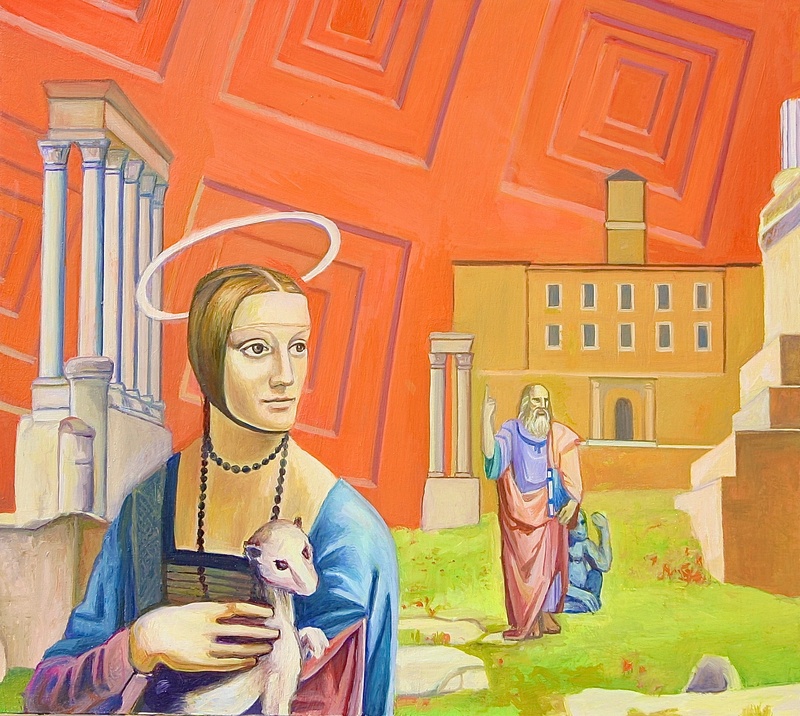 "Allegory: Leonardo", oil, 30" x 22"
I traveled to Europe and took around 3000 photos of sites. I have also since returned to Europe many more times and taken just as many photos each time. These photos are stitched together, around 20 photos at a time, to make panoramas. Europe is infused with a cycle of creation, war, and reconstruction. I consider these places to be sacred sites. 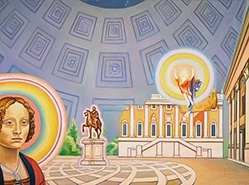 The first stage of the painting is to block in the panorama. I eyeball everything I paint. Many times it will be significant changed as I work through the painting cycle. The stage has been set. 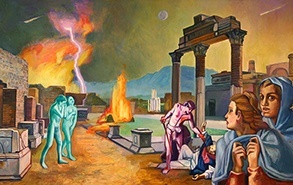 Allegory, Forum Vortex", oil, "17 x 19"
The next process is to choose the “actors” of this stage to tell a narrative or to be part of an allegory. Something has to stand in or symbolize something else, and moreover, there has to be conversation between these actors. I always like to include an animal also in this drama, since humans often make themselves out to be too important. To this end I look at thousands of references, and comb out only a select a precious few. These sources could be from art history or are in the public domain. Early in the painting process actors may “get the bump”, or they might be drastically rescaled or moved about. Juxtaposition and contrast are important. Tons of adjustments are made throughout the process, and I do not mind scraping away or repainting areas many times over to get the right configuration. I aim for a Hyper-Baroque style. Colors are maximized and haloed effects add to the sense of the miraculous. This is in the spirit of El Greco and Magritte; conjuring is married to magic realism. It is only after much experimenting, revising, and amplifying effects up the limit, that I can finally “surrender” the painting to completion. I work with maybe 6 paintings at a time to see how they influence each other. This invites me to stake out new territory with another batch of paintings. In the end, it is all problem- solving. It requires a lot of time to resolve a historical or ethical situation into a dramatic and interesting conclusion. Tom received his BFA from the Ohio State University and his MFA from Pennsylvania State University. Soon thereafter he attended the Skowhegan School of Sculpture and Painting. He is a proud founder of and a fulltime associate professor at Pennsylvania College of Art & Design in Lancaster, PA. He has 38 years of fulltime college-level teaching experience. Tom has thoroughly absorbed Art History from years of teaching it as well as having travelled extensively in Europe five different times. Tom has had 15 one-person shows, the most recent being at the City Hall Gallery in Lancaster, PA. Some of his other one-person shows have been in the Jun Gallery and the Hahnemann University Gallery, both in Philadelphia, PA. 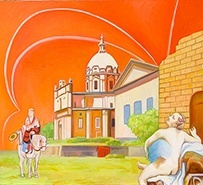 He has participated in over 60 group or juried shows. He has won four First prize painting awards, as well having been exhibited four times in the prestigious Butler Art Museum in Youngstown, Ohio.